A somewhat hidden feature not spoken of directly during today's WWDC keynote is a new app for iOS 9 called "Move to iOS," which will allow current Android users a hassle-free migration experience from their Android phone to the iOS ecosystem. Once downloaded on each phone, the app will help users securely transfer all of their important data: contacts, message history, camera photos and videos, web bookmarks, mail accounts, calendars, wallpaper, and DRM-free songs and books. In addition, Apple claims the app will "help rebuild your app library, too," siphoning through any free apps used on Android and suggesting them as downloads on the iOS App Store. Simultaneously, any paid Android apps are immediately added to each user's iTunes Wish List as future reminders. Move to Samsung app is already in the works. As if to say ”Welcome out of hell. Here’s a nice glass of ice water, it’ll be a lot like this from now on friend." 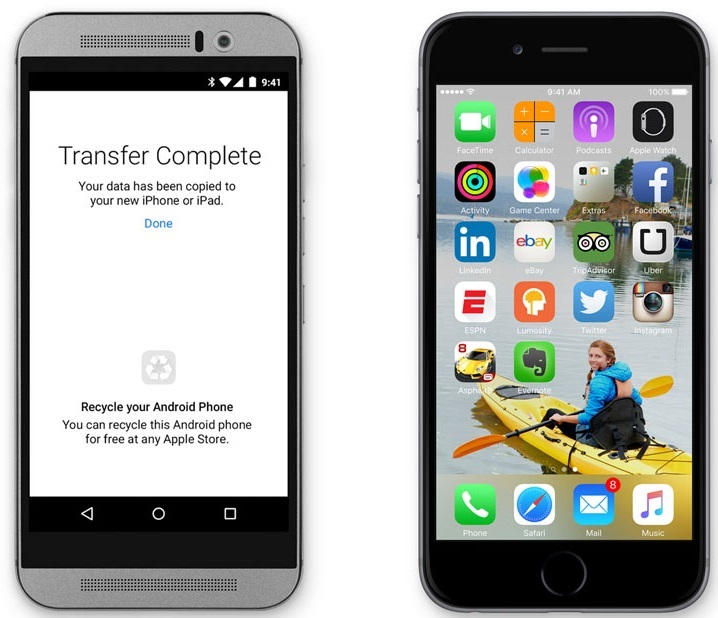 Love that you can "recycle" your old Android phone at any Apple Store. They already have it its called "Smart Switch"
Google should reject that app. Simply because Apple will never allow such an app on their platform. Google made their bed preaching all the "openness" so this comes with the territory. I wonder if Apple would allow a Move to Android app in their App Store. I seriously doubt it. lol.. Why would they do that? They'd have to be really stupid, and they're not..
apple wouldnt let android put this app on their App Store. A 'move to iOS' app wouldn't make any sense on the App Store.